Monolith Semiconductor announces the availability of engineering samples of 1200V, 5A and 10A Silicon Carbide (SiC) Schottky diode in TO-220 package. These SiC diodes feature zero reverse recovery current, superior avalanche ruggedness, excellent surge current capability and low leakage currents at high temperatures. The diodes have been manufactured at X-FAB Texas’ 150mm SiC foundry. The collaboration with the US Department of Energy and Power America has been key in achieving this milestone in advanced manufacturing of the SiC devices. states Dr. Sujit Banerjee, CEO of Monolith Semiconductor Inc. Dr. Kiran Chatty, VP of Product Development stated, “The superior switching performance of these diodes will reduce losses by over 50% compared to Silicon diodes resulting in higher energy efficiency in power electronic applications such as solar inverters, motor drives and power supplies”. Semiconductor Manufacturing International (SMIC) has reached an agreement with LFoundry Europe (LFE) and Marsica Innovation (MI) to acquire a 70% stake in LFoundry for EUR49 million (US$54.5 million), according to the companies. LFoundry is headquartered in Italy and owned by LFE and MI. At the closing of the transaction, SMIC, LFE and MI will own 70%, 15% and 15% of LFoundry, respectively. SMIC’s total production capacity includes 162,000 8-inch wafers per month and 62,500 12-inch wafers per month, which represents a total 8-inch equivalent capacity of 302,600 wafers monthly. LFoundry’s capacity amounts to 40,000 8-inch wafers per month. Thus, by consolidating the entities, overall total capacity would increase by 13%; this combined capacity will provide increased flexibility and business opportunities for supporting both SMIC and LFoundry customers, the companies said. SMIC has a diversified technology portfolio, including applications such as radio frequency (RF), connectivity, power management IC (PMIC), CMOS image sensors (CIS), embedded memory, MEMS, and others – mainly for the communications and consumer markets. Complementarily, LFoundry’s key focus is primarily in automotive, security, and industrial related applications including CIS, smart power, touch display driver IC (TDD”), embedded memory, and others. Such consolidation of technologies will broaden the overall technology portfolios and enlarge the areas of future development for both SMIC and LFoundry, the companies indicated. Semiconductor-grade silicon wafer maker GlobalWafers has disclosed it will acquire a 100% stake in the wafer business unit of Denmark-based Topsil Semiconductor Materials A/S at Danish Krone 320 million (US$48.27 million). GlobalWafers is a subsidiary solar wafer maker Sino-American Silicon Products (SAS). Topsil is a globally main developer of FZ (float zone) wafer manufacturing process and a main producer of FZ wafers, GlobalWafers said. Topsil-produced FZ wafers are mainly used to make high- and medium-power devices used in heavy electric machines, automated industrial equipment, power-generating equipment, wind power-generating turbines and high-speed and mass rapid transit trains, GlobalWafers indicated. The acquisition covers products, personnel, technology and business relations of Topsil’s wafer business unit as well as Topsil’s wafer factories in Denmark and Poland, GlobalWafers said. Through the acquisition, GlobalWafers can extend wafer manufacturing technology from CZ (Czochralski) process to FZ process and marketing presence from Asia and North America to Europe, the company indicated. The acquisition is expected to be finished by the end of June 2016, GlobalWafers said. Basic 3C Inc., a Longmont startup aiming to go to market soon with a new type of semiconductor, has added about $650,000 from existing investors to a Series A round of funding. Basic 3C president Bart Van Zeghbroeck said this week that the hope is that the latest funds get the company through the next six months before raising a Series B. Founded in April 2014, the company — based at 1830 Boston Ave. — has been in product-development mode, but is hoping to commercialize its first product in the next six months. Basic 3C’s semiconductors will be made from cubic silicon carbide, rather than silicon. Geared toward high-power applications operating at 600 volts or more that require efficient power conversion, the product will have higher thermal conductivity and do well in “operationally rugged environments,” Van Zeghbroeck said. He said targeted applications include solar panels, wind turbines and electric vehicles. A reduced cooling requirement would mean reduced size and weight and thus, in something like an electric vehicle, improved efficiency and range. “We’re looking at significantly better material properties, and that makes a difference in the end application,” Van Zeghbroeck said. Investors in the company include Boulder-based Infield Capital and Texas-based Dankat LLC. Van Zeghbroeck is on leave from the University of Colorado, where he has been an electrical engineering professor since 1990. He and investors purchased the technology and intellectual property for Basic 3C from a Golden company, Silicon Carbide Systems, that had gone bankrupt. Van Zeghbroeck said Basic 3C will initially do manufacturing at its current space in Longmont. The company has fewer than 10 employees, but he said he expects that number to grow to 15 or 20 within the next 18 months. POWDEC has succeeded in making GaN PSJ (Polarized Super Junction) transistors on sapphire substrate having both 1,200 V rating-voltage and the on-resistance of less than 100 mΩ. Powdec has developed a PSJ (Polarization Super-junction) structure instead of the FP (Field-Plate). The PSJ is so strong against the current collapse that sapphire can be used as substrate. As a result, the device is free from the electric breakdown caused by the substrate. And Powdec succeeded in obtaining up to 6 kV of the breakdown voltage for the device with GaN thickness as thin as 1 μm. GaN-on-Si devices are applied to the conversion systems only below 600 V rating range. However, the present achievements using the unique PSJ-on-sapphire platform shows that the PSJ devices can enter into the application fields where Si-IGBTs dominate today. What is Polarized Super Junction? SJ (Super-junction) is a structure to improve both the conductivity and the breakdown voltage of the Si power-MOS transistor. The drift layer consists of thin p/n stacks while the conventional one consists of a single n-type layer. PSJ (Polarization Super-junction) is a method to implement the SJ effect in the GaN/AlGaN system where the polarization effect functions as SJ. Most GaN device makers develop GaN-on-Silicon (or GaN/Si) power devices. Powdec’s 1,200V devices are GaN-on-Sapphire devices. Not using the Silicon and using Sapphire implies intrinsic differences in the device structure and operation. GaN power devices today are implemented on Si(111) substrate, which is called “GaN-on-Si” or “GaN/Si”. The thickness of the nitride layers needed for 600V rating devices is generally 5μm or more. The GaN/Si devices are equipped with Field-plates (FP are conductive plates set on the gate to split the steep electric field). FPs are indivisibly needed for the conductive Si substrate to mitigate the current collapses. Current-collapse is another name for the current decreasing phenomenon during the transistor operation. The channel electrons are scattered and deployed around the channel by the strong electric field. These immobile electrons act as the negative bias for the channel resulting in the decrease of the current. Sapphire substrate is also a common platform for GaN-LED production and the growth runs successively without chamber-cleaning. On the other hand, the growth on Si substrate needs chamber-cleaning prior to the deposition to avoid the unwanted chemical reactions between GaN and Si interface. The chamber-cleaning takes extra time and cost. 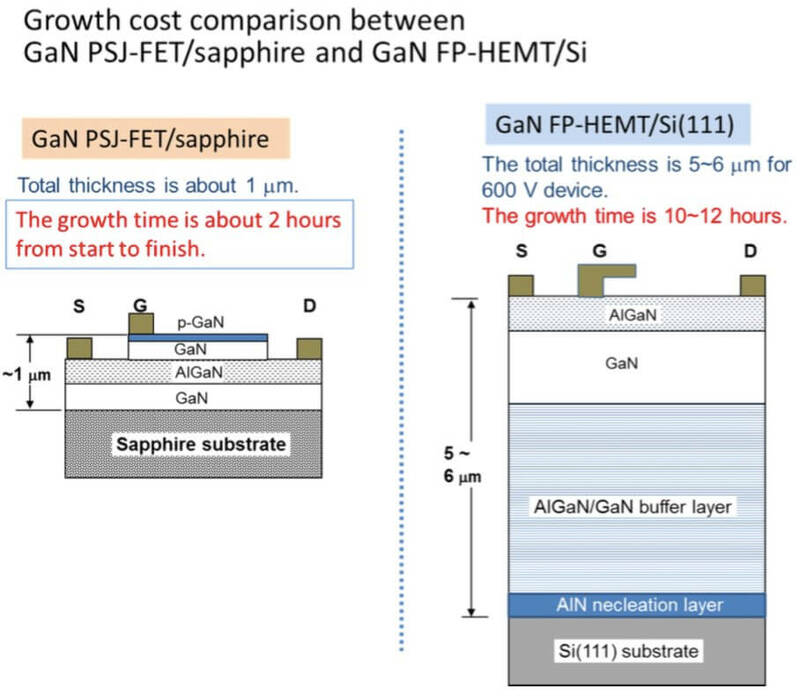 As a whole, the throughput for GaN PSJ-FET/sapphire growth is roughly ten times larger than that of the GaN FP-HEMT/Si growth. The thermal conductivity of sapphire, 40 [W/m K], is lower than that of Si, 150 [W/m K]. This problem is solved here by face-downing the die and contacting it on the base substrate, so that the heat can dissipate without going through the sapphire. As a result, the device has operated at as large as 8 amperes of the continuous current mode (CCM) under free standing (without fin) condition. X-FAB Silicon Foundries has announced it will expand the capacity and capabilities of its Kuching-based foundry operation, X-FAB Sarawak Sdn. Bhd., to meet accelerating demand for its core technologies – the 0.18µm and 0.35µm process platforms. With revenue having grown 25 percent for each of the past two years, and similar growth expected for the next two years, X-FAB plans to invest a total of US-Dollar 114 million between 2015 and 2017. This includes capex spending amounting to US-Dollar 29 million in the current year. X-FAB Group with its clear focus on automotive, industrial and medical applications has transitioned X-FAB Sarawak from a manufacturing facility for commodity-type products into a high-value-add business for products with a long life cycle. Since it became part of the X-FAB Group in 2006, the site in Kuching has undergone a complete change in most of its technology portfolio, its application focus, its customer base, product life cycles and quality systems. “X-FAB’s operation in Sarawak has been driving the growth of local economy. They are employing more than 1,000 staff where more than 80 percent of them are considered to be high income earners. We believe that this expansion will act as a catalyst in attracting other high technology firms to establish their operations in Malaysia as they will be able to leverage on the wafer fabrication services provided by X-FAB,” he added.